S - just ask - Chef Ted. Precision forged entirely by hand from a single piece of high carbon, no-stain steel, this fine blade is perfectly curved for effortless mincing, dicing, chopping. A wide bolster provides heft, balance and safety in handling. 1: This product is 7CR17 Damascus tool set, the toughness is higher than 8Cr17, 11Cr17. Light and sharp, it is very convenient for use as a kitchen cutting tool;. Product: Damascus Laser Three-Piece Knife. Japan MAC TH-100 10" w/ Dimples. Condition is Used. Comes with a free messermeister guard. Knife is very sharp, house hold use only. No broken tips. Shipped with USPS Priority Mail. It’s only sharping once but never been used. Chef’s Knife 270mm. Shipped with USPS Priority Mail. (This knife is not only functionally created to be perfect at slicing and dicing but it was created to also be aesthetically pleasing as well. 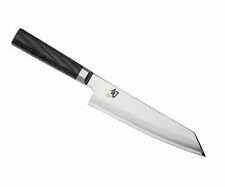 CHEF GRADE QUALITY: 1) Specifically designed bolster with a carved out finger groove that makes holding the knife natural and secure. 1 x 3" Fruit parer. Super hard, high-density and sharp blade, not easy to be blunt. No stimulation to your eyes when cutting excitant food like onions. 1 x 4" Fruit slicer. 1 x 6" Chef knife. Ceramic knife 4 Pieces set,Which made of ceramic and ABS material. Zirconium oxide ceramics also have very high thermal expansion. Ultra sharp blade made of zirconium oxide. Near diamond hardness. The most advanced Zirconium Ceramic formula is used for these knives. Condition is New. Ne ve r us ed. Nice th ic k le at he r sh ea th. R az or s ha rp. I h av e oiledit wi th o li ve o il t o pr ot ec t it. T ha nk s fo r lo ok in g. W ou ld b e a gr ea t kn if e forcamping et c.
T he YARENH 8" Damascus Chef Knives is designed to be multipurpose knife, and it’s a perfect tool for chopping, slicing, cutting and dicing. It’s suitable for professionals who include chefs, food caterers, culinary experts as well as ordinary people. Super Sharp Blade German 73 Layers Damascus Steel with Ergonomic Handle. 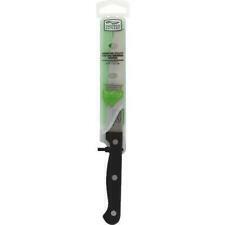 It is not suitable for slicing through frozen foods as this may make the blade lose its sharpness. UTILITY KITCHEN CHEF KNIFE. Optimal blade thickness of 3 mm ensures sturdiness and even makes it suitable for delicate cuts such as slicing sushi or the fine julienne. Nice gift idea – Our cooking knives make for an ideal gift for anyone who loves cooking or even for professional chefs – be it friends, family or colleagues! Looking, lighter weight, very sharp edged knife. (I prefer a wider blade. It's the only reason I'm. Never used. The beechwood handle is a nice. ). Razor sharp, high carbon, stain-free Japanese steel. Ergonomic polypropylene handle with textured finger points for better grip, slip-resistance, and safety. Easy edge maintenance and rapid sharpening. Sora knives feature a VG10 cutting core with stainless steel on either side, creating a san mai edge that provides stain resistance. Blades have a mirror-polished Japanese 420J blade upper and a 16-degree cutting edge on either side. Trending at $78.61eBay determines this price through a machine learned model of the product's sale prices within the last 90 days. However, knife has been engraved on both sides of the blade. (See photos). Knife has dropped on its point & may be bent & point is irregular as seen in photos. It will cut fine but is irregular. The last two photos show the blade edge to show that you can not see that it is very bent but it is a tiny bit bent. The WHITE DEER 1095 Forged Steel 12in Blank Knife has been forged and handmade, then heat treated to 58-60 HRC Rockwell hardness scale. This WHITE DEER 1095 Forged Steel 12in Blank Knife features a flat grind with profiled edge. Manufacturer Part #: DM0706. Item has been engraved on the bolster on one side only, with the letters: ACK. Knife has tiny tip flaw (missing tiny tip), see photos. Black laminated PakkaWood D-shaped handle provides maximum comfort. Kuma partners with an industry leading manufacturer whose expertise in steel and cutlery exceeds 20 years. Kuma Chef Knife - CUTS LIKE A DREAM - Razor Sharp 8" Chef's Knife - EASY TO U. Risk Free: Best knife for your money - A truly amazing knife should be attainable for everyone. The most important feature of any knife is its edge. The blade is made from one of the finest steels- CROMOVA 18 stainless steel. This special steel is ice-tempered and hardened to a Rockwell Hardness of 56-58, which remains razor sharp longer than any other steel and resists rust, stains and corrosion. The Knife is New/Unused in its box. Global G-2 Forged stainless steel 8" Chef knife. Madein Japan.. Shipped with USPS Priority Mail. A great all-rounder. Ergonomically Designed Carving Knife. Extra wide blade. Blade Propertiesextra wide. Type of edgenormal straight edge. Length of blade7.9 in. 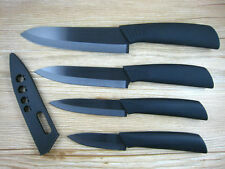 Black Sharp Chef's Knife 5 Piece Set Vegetable Peeler. • 1- Ceramic Peeler. • Not easy breed bacteria. • 1- 4" Fruit Knife (cutting fruit). 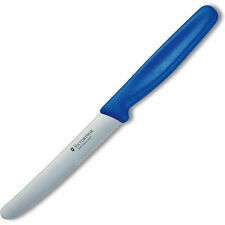 • 1- 3" Paring Knife (paring fruit/vegetables). 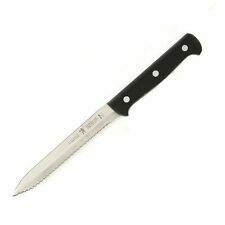 • 1- 5" Chef Knife (slicing/food prep). Material : 67 layers Japanese Damascus steel & 10Cr15CoMoV core. Material and craft : multilayer Damascus steel imported from Japan 10Cr15CoMoV core optical lens processing forging process. Handle : Excellent rosewood handle, surface polishing. Sharpen on whetstone on flat surfaces onlyUsage & Care: Wash Knife with dishwashing liquid before use. always dry blade thoroughly after washing. 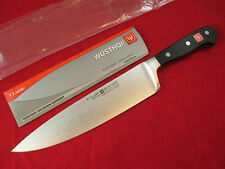 Wusthof Classic 6 inch Wide Chefs Knife, - 4584/16 - *New. Condition is New. Shipped with USPS Priority Mail. You have found the missing piece to your Knife Collection! Here is a Chef Knife (G-2) from Global, Yoshikin, Japan. The pattern is Cromova and features a Stainless Steel Blade & Handle. The handles feature Black Dots. The blade is 7 3/4" long, and the total knife length is 12 3/4" long. It is in excellent preowned condition, but does have some Fine Scratches from Use (see Pictures). Please see our Not Just China Store for more of this pattern. We try to ship within 24 hours of receiving payment. If you have questions or you feel there is a problem, please e-mail us. We will normally get back to you within 24 hours. Thanks for looking at our store!. S - just ask - Chef Ted. Wide bolster for balance Very good used condition. This knife has been professionally sharpened and is ready for use. Precision forged entirely by hand from a single piece of high carbon, no-stain steel, this fine blade is perfectly curved for effortless mincing, dicing, chopping. The Shun Blue Kiritsuke features a traditional Japanese blade shape used by executive chefs for a great variety of cutting tasks. The blade is made by Japanese san mai (3-layer) construction, with a carbon steel cutting core sandwiched between two layers of mirror-polished stainless steel. Global GS-3, CROMOVA 18. Forged stainless steel 5" Chefs knife. Genuine Global. Made in Japan.Superior quality, sophisticated ergonomic Handle. Look carefully. and/or pictures as soon as is reasonably possible. ITEM IS IN GOOD USED CONDITION. HAS NORMAL SURFACE WEAR. for your convenience and value. Condition is Used. VG-MAX "super steel" blade is clad on each side with 34 microthin layers of stainless steel, creating a variegated look reminiscent of a Damascus-style blade. This knife has a a nicked tip and a little chip underneath it. SIGMAFORGE knife is forged from a single piece of Special Formula High-Carbon NO STAIN stainless steel. 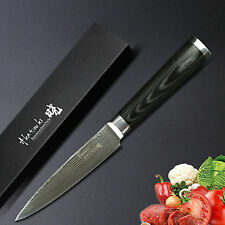 Japanese Nosyu Masamune Chef's Knife 180mm. Model : Nosyu Masamune BB. Made in SEKI JAPAN. Versatile knife. Blade length : 180mm (7.1"). Handle : Polyacetal with Bolster. Type : Chef's Knife. Blade materials are especially important as they affect the sharpness of the kitchen knives. Zwilling J.A. 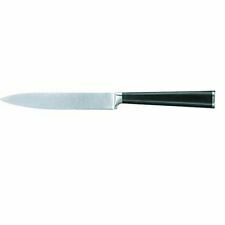 Henckels Solingen Germany 31021-200 CHEF knife PROFESSIONAL "S"
Nice Chef knife by Zwilling J.A. Henckels model 31021-200 professional S made in Germany. It is in used condition and shows normal wear. Premium vg10 Steel - Razor sharp blades: Super vg10 core with multi-layer high carbon stainless steel is non-stick, has an exquisite Damascus pattern and is liquid nitrogen tempered ensuring long lasting performance! Used for 1 week. Don’t like because it’s heavy. I know it’s made in Germany forged stainless steel, not stamped. Sigmaforged. Forged is harder than stamped. Up for sale is a Kajiwara Kurouchi 210mm Gyuto (Japanese Chef's Knife). Gyuto are general purpose kitchen knives like their Western counterparts, upon which their origins are based. Finish - Kurouchi (rustic), with unground sections of the knife left with marks and coloration from the forging, hardening, and tampering process. Hand forged by Japanese artisans, the Kingu Cutlery Chef Knife is a multi-functional knife that will bring out the Chef in you. Lightweight, Japanese style blade perfectly balanced for a precise cut. A reliable chef's knife is an essential tool in the kitchen whether you're a professional chef or a home cook. It's a versatile knife that's used for everything from cutting, slicing, mincing, to chopping fruits, vegetables, and meat. However, the average person may not be able to tell the difference between a quality chef knife and a subpar one. You'll often find a chef knife included in cutlery sets, but this can be misleading, as one knife doesn't fit all. A common way to choose the right knife is to refer back to the kitchen knife you were using previously. Figure out what aspects of the knife that you liked and what you didn't like. This will allow you to find a new chef knife that suits your needs. For example, you may find that the size is a little too big for your hands. If you've been using a 10-inch knife, the classic eight-inch chef knife may be a better fit for you. You may want something slim and light to make it easy for you to maneuver with it. Upon cutting, you may find that the balance of the knife is important to you and may want a knife with a weight that is evenly distributed throughout the blade rather than the front or the back. Most quality chef knives are forged from stainless steel and are sharp right out of the box. They should feel comfortable on your hands and should slice through objects without much pressure. You'll find that one of the differences between kitchen knives is the handle. Some kitchen knives have the blade set into it while others are full tang which means its full length is embedded into the handle. You'll often see full-tang knives given extra security in the handle with rivets. This feature is often advertised more often than knives which have the blade set into the handle. This is only the case if you're planning on using your knife for a long time. The handle will only start to come loose after many years of use. You'll also find that some high quality knives are one whole steel piece. These knives are usually crafted for professionals that are looking for the best knife that's available. What kitchen knife brands are well-known? There are many go-to knife brands that are preferred by enthusiasts and professionals alike. Wusthof is a well-known brand founded in Solingen, Germany. Wusthof has a reputation for durable, reliable, and high quality knives. The Wusthof Classic is a knife that's found in many chef kitchens around the world. 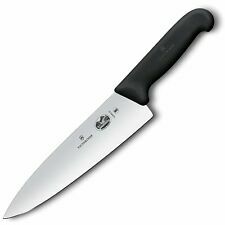 Another popular brand that is comparable to Wusthof is Zwilling J.A. Henckels. Henckels is highly regarded by professional chefs for their craftsmanship and quality of materials. They are also known for lasting many years and while it's on the higher end pricewise, Henckels are often viewed as a great investment. Some other consumer brands include Victorinox and Messermeister. Victorinox is known for their Swiss Army knives and produce highly reviewed kitchen knives as well. Messtermeister is another German brand that produces high-end forged-wood handled knives. Japanese knives are another consideration if you want more precision and a top-of-the-line product.